One of the most controversial subjects regarding the ancient prehistoric cultures of North America concerns what we refer to as the Unique Physical Types (UPT). 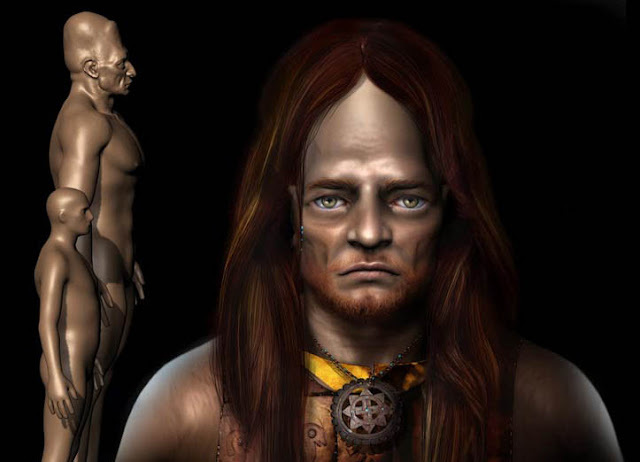 For the purposes of what follows, these UPT are often gigantic humanoid skeletons with hyper elongated or high-vaulted crania, occasional extra or pathological detentions (including several reports of double or triple rows of teeth), and are usually discovered in the burial mounds and associated graveyards of the Adena-Hopewell, Archaic Cultures, and Southeastern Ceremonial Complex. Digital sketch, ancient Florida giant. Image courtesy of Marcia K. Moore, Ciamar Studio. These examples represent the various anomalous features of the Unique Physical Types, which were encountered in the 19th and early 20th centuries. Spatially and culturally, they illustrate the extensive temporal and geographical range of these types. The Kanawha Valley Mound Builders left their remains in an area where some of the oldest Fayette Thick Adena Pottery and diverse types of mound construction have been found. It has recently been suggested that sites in West Virginia may push the “acceptable” beginning of the Early Woodland Period back to 1400-1300 BC. The samples from Illinois come from a region where Archaic era mounds have been found, often with Hopewell Mounds built over and into them hundreds or thousands of years later, as in the case of Elizabeth Mound 1 and Peter Klunk Mound 7. The Etowah Mound (Mound C) is ascribed to the Mississippian Cult, dated to 950-1450 AD. After the Government and Philanthropies took over American Archaeology in the 1900s, the establishment undertook the policy of flatly denying the existence of anomalous remains. The actual beginning point for the revisionist tendency in the National Museum was very early. By 1851, E G Squier was working to debunk theories of pre-Columbian contact, and several decades later, Gerald Fowke would attempt to discredit and jettison the work of virtually every researcher in the field up to his day, including the skeletal measurements of his fellow agents in the Bureau of Ethnology. However, the denial of the Unique Types truly got underway during the reign of Ales Hrdlicka as the Curator of Anthropology at the Smithsonian (circa 1903). And the ‘giant’ and ‘eight-foot’ skeleton is to this day the almost stereotyped feature of many an amateur report of a find of skeletal remains in Florida as well as other parts of the country. All these reports…it may be said once and for all, are exaggerations. Dr Hrdlicka blames the ‘will to believe’ of amateur anthropologists for many reports of ‘discoveries’ which find their way to his office with monotonous frequency…the purported ‘finds’ describe a race of ancient giants between 7 and 8 feet tall with bones and jaws considerably larger than those living today…Next to human ‘giants’ Dr. Hrdlicka reports, fancy finds its sway with human ‘dwarfs’. The skeletons of these Hitherto Unknown American Aborigines Showed They All Ranged in Height from Six and One-Half to Seven Feet…Excavating in the sand dunes of the sun-sprayed Golden Isles, Georgia, archaeologists have gouged out the strange record of an amazing prehistoric race of giants…What manner of men were these, the members of whose tribe all averaged six and one-half and seven feet tall?…Some of the first skulls to be disinterred by Preston Holder have already been examined at the Smithsonian Institute by Dr Ales Hrdlicka, foremost authority on North American Types. Currently there are a slew of books, DVDs and even at least one TV show documenting the exploits of modern hunters who are “on the trail” of the anomalous dead, who insist that if at least one of these skeletons could be found and presented to the “experts” it would somehow alter the professed paradigm of the establishment itself. However, as we will demonstrate in part 2, the “experts” have already rediscovered, photographed, and measured these types of remains. 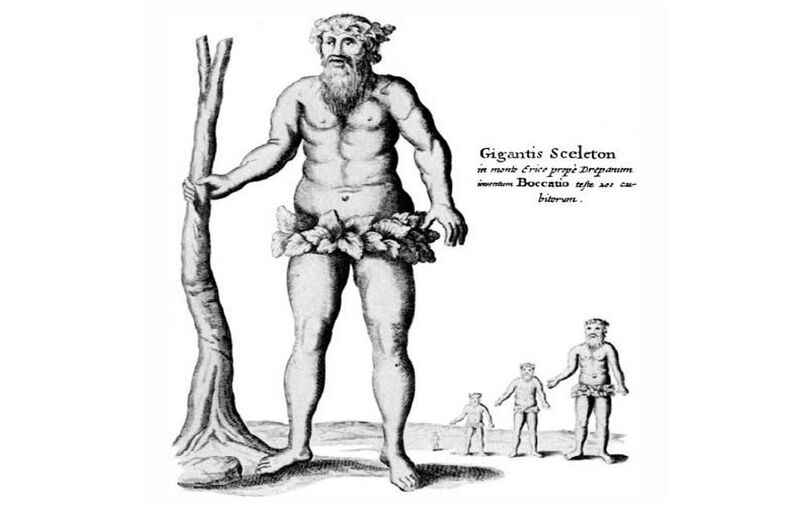 Illustration from “Mundus subterraneus” – suggesting that fossil bones were from giants (Wikimedia Commons). Following our overview of discoveries of gigantic humanoid skeletons in the burial mounds and associated graveyards of the Adena-Hopewell, Archaic Cultures, and Southeastern Ceremonial Complex, we will now document the discovery of the Unique Physical Types (UPT) even after the institution of the mainstream policy of denial, or “post cover-up”.